There is a deep sense of pride in wearing the burgundy and blue for all who are part of the John Paul College family. We are a Christian ecumenical school with traditional family values. Our students learn within a quality teaching environment and a curriculum that engages them in real world challenges. We understand that quality education comes from a three-way partnership between the parents, students and teachers, and we consider parents as integral partners in the education of their children. As pioneers of technology in education, John Paul College was one of the first schools in Australia to adopt laptop computers. This year, we celebrate 22 years of our leading-edge laptop program. We have also developed an App, which is available for download from the Apple and Android stores, and an online newsletter, which can be subscribed to through our website. Our vibrant and enthusiastic learning community is built on mutual respect, traditional values, school pride and strong direction. With strong academic results and one of the largest co-curricular programs in Australia, John Paul College is a place where lifelong friendships are made. 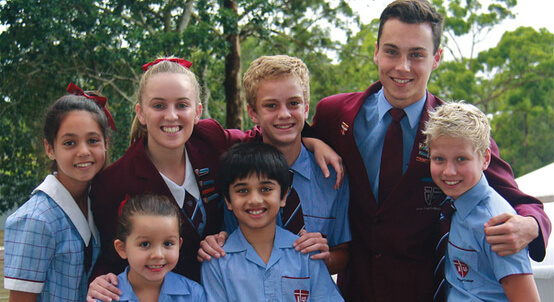 As one of Queensland’s largest and most progressive independent, coeducational schools, we have a reputation for producing outstanding citizens who have the confidence to take on the world. Students can choose from a number of study pathways, including the OP, the International Baccalaureate Diploma Programme, Vocational Education and Training or our Horizons program of sporting and performing arts excellence. Our campus has modern classrooms and sports and performing arts facilities spread over 53 hectares of beautiful green space, which includes our community farm and an award-winning sustainability program. In addition, we offer a full range of support services including chaplaincy and counsellors, a health and wellbeing centre, learning enhancement, a Positive Education program and a Careers Development Centre. In January 2015, we opened our new Boarding Village, which has become home to 48 students who live and study together in a safe and nurturing positive learning environment. Our priority is to provide each of our boarders with a happy, safe and supportive home environment where they will make friends for life. For further information visit www.johnpaulcollege.com.au or phone (07) 3826 3333.